Shape memory alloys (SMA’s) are metals which exhibit two very unique properties, pseudo-elasticity and the shape memory effect. Because these materials are relatively new, some of the engineering aspects of the materials are still not well understood. 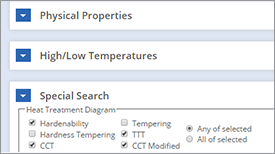 Many of the typical engineering descriptors, such as Young's modulus and yield strength, do not apply to shape memory alloys since they are very strongly temperature dependent. On the other hand, a new set of descriptors must be introduced, such as stress rate and amnesia. Shape memory alloys (SMA’s) are metals which exhibit two very unique properties, pseudo-elasticity and the shape memory effect. Arne Olander first observed these unusual properties in 1938, but not until the 1960’s were any serious research advances made in the field of shape memory alloys. The basic phenomenon of the shape memory effect was widely reported a decade later by Russian metallurgist G. Kurdjumov and also by Chang and Read. However, presentation of this property to the wider public came only after the development of the nickel-titanium alloy (Nitinol) by Buehler and Wang. Since then, research activity in this field has been intense, and a number of alloys have been investigated, including Ag-Cd, Au-Cd, Cu-Zn, Cu-Zn-AI, Cu-AI-Ni, Cu-Sn, Cu-Au-Zn, Ni-AI, Ti-Ni, Ti-Ni-Cu, Ni-Ti-Nb, Ti-Pd-Ni, In-Ti, In-Cd and others. The most effective and widely used alloys include Ni-Ti, Cu-Zn-Al, and Cu-Al-Ni. Crystallography of shape memory alloys have been studied for the last four decades. Because these materials are relatively new, some of the engineering aspects of the materials are still not well understood. 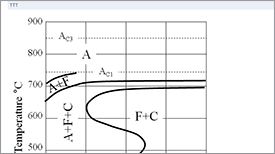 Many of the typical engineering descriptors, such as Young's modulus and yield strength, do not apply to shape memory alloys since they are very strongly temperature dependent. On the other hand, a new set of descriptors must be introduced, such as stress rate and amnesia. SMA’s are useful for such things as actuators which are materials that “change shape, stiffness, position, and other mechanical characteristics in response to temperature or electromagnetic fields”. The potential uses for SMA’s especially as actuators have broadened the spectrum of many scientific fields. The diverse applications for these metals have made them increasingly important and visible to the world. The alloys that exhibit so-called “shape memory” can undergo surprisingly large amounts of strain and then, upon temperature increase or unloading, revert to their original shape. Ni-Ti based shape memory alloys have to date provided the best combination of materials properties for most commercial applications. However they are very expensive compared with Cu-based shape memory alloys. 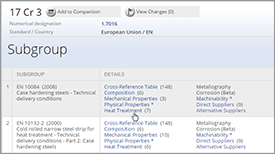 In many applications, Cu-based alloys provide a more economical alternative to Ni-Ti. Cu-Zn based shape memory alloys have actually been used and Cu-AI based shape memory alloys have shown promise. The two unique properties described above are made possible through a solid state phase change that is a molecular rearrangement, which occurs in the shape memory alloy. The two phases, which occur in shape memory alloys, are martensite and austenite. 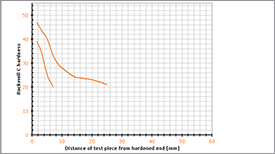 Martensite is the relatively soft and easily deformed phase of shape memory alloys, which exists at lower temperatures. The molecular structure in this phase is twinned which the configuration is shown in the middle of Figure 1. Upon deformation this phase takes on the second form shown in Figure 1, on the right. Austenite, the stronger phase of shape memory alloys, occurs at higher temperatures. 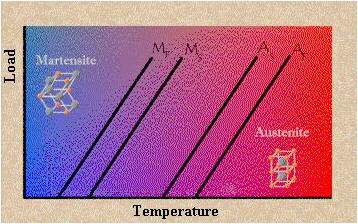 The shape of the Austenite structure is cubic, the structure shown on the left side of Figure 1. 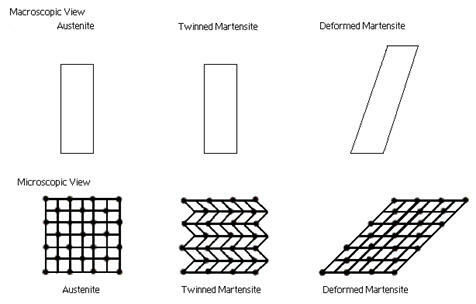 The undeformed martensite phase is the same size and shape as the cubic austenite phase on a macroscopic scale, so that no change in size or shape is visible in shape memory alloys until the martensite is deformed. 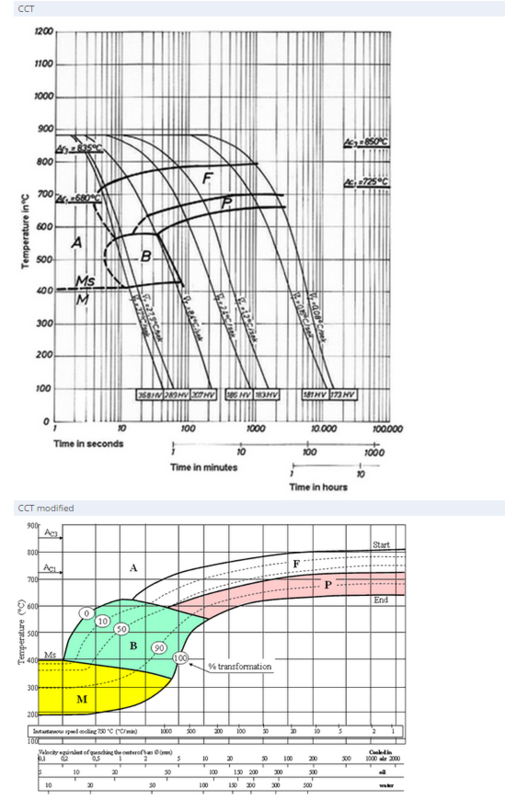 The temperatures at which each of these phases begin and finish forming are represented by the following variables: Ms, Mf, As, Af. The amount of loading placed on a piece of shape memory alloy increases the values of these four variables as shown in Figure 2. The initial values of these four variables are also dramatically affected by the composition of the wire (i.e. what amounts of each element are present). The shape memory effect is observed when the temperature of a piece of shape memory alloy is cooled to below the temperature Mf. At this stage the alloy is completely composed of martensite which can be easily deformed. After distorting the SMA the original shape can be recovered simply by heating the wire above the temperature Af. The heat transferred to the wire is the power driving the molecular rearrangement of the alloy, similar to heat melting ice into water, but the alloy remains solid. The deformed martensite is now transformed to the cubic austenite phase, which is configured in the original shape of the wire. Nickel-titanium alloys have been found to be the most useful of all SMA’s. Other shape memory alloys include copper-aluminum-nickel, copper-zinc-aluminum, and iron- manganese-silicon alloys. The generic name for the family of nickel-titanium alloys is Nitinol. In 1961, Nitinol, which stands for Nickel Titanium Naval Ordnance Laboratory, was discovered to possess the unique property of having shape memory. William J. Buehler, a researcher at the Naval Ordnance Laboratory in White Oak, Maryland, was the one to discover this shape memory alloy. It was discovered that Nitinol had phase changes while still a solid. These phase changes, known as martensite and austenite, “involve the rearrangement of the position of particles within the crystal structure of the solid”. Under the transition temperature, Nitinol is in the martensite phase. 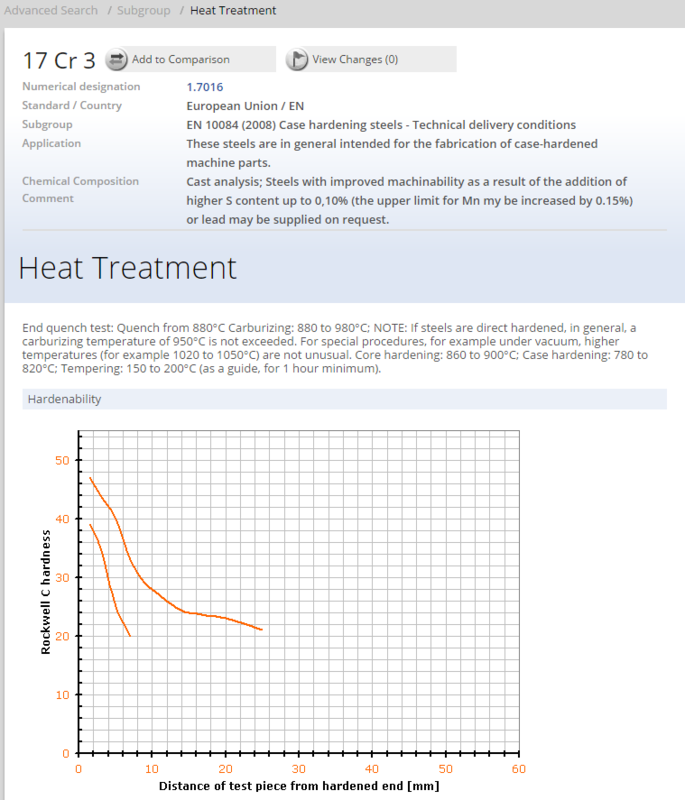 The transition temperature varies for different compositions from about -50°C to 166°C. In the martensite phase, Nitinol can be bent into various shapes. To fix the “parent shape” (as it is called), the metal must be held in position and heated to about 500°C. The high temperature “causes the atoms to arrange themselves into the most compact and regular pattern possible” resulting in a rigid cubic arrangement known as the austenite phase. Above the transition temperature, Nitinol reverts from the martensite to the austenite phase which changes it back into its parent shape. This cycle can be repeated millions of times. 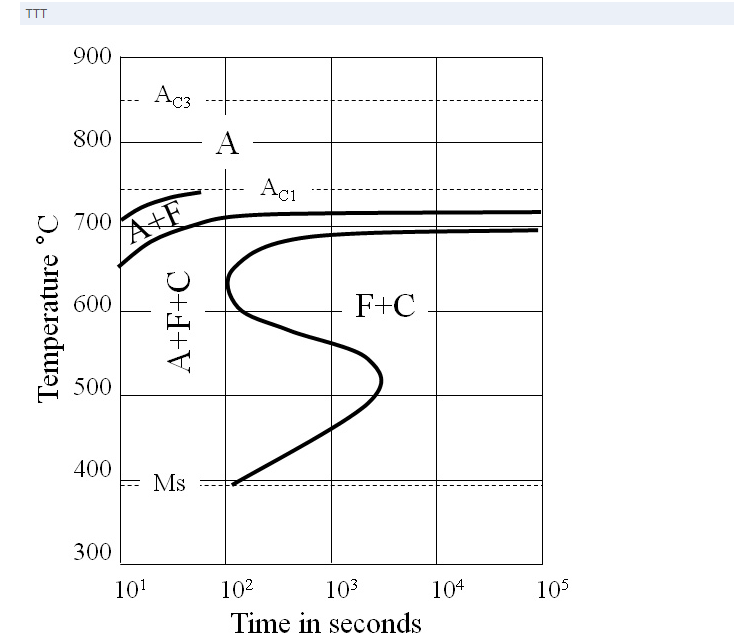 Pseudo-elasticity occurs in shape memory alloys when the alloy is completely composed of austenite (temperature is greater than Af). Unlike the shape memory effect, pseudo-elasticity occurs without a change in temperature. 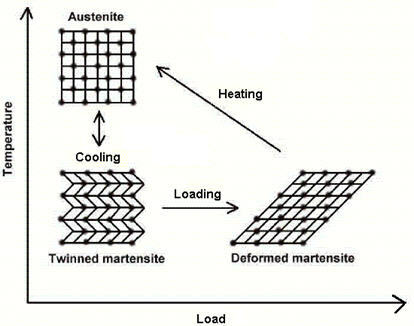 The load on the shape memory alloy is increased until the austenite becomes transformed into martensite simply due to the loading. 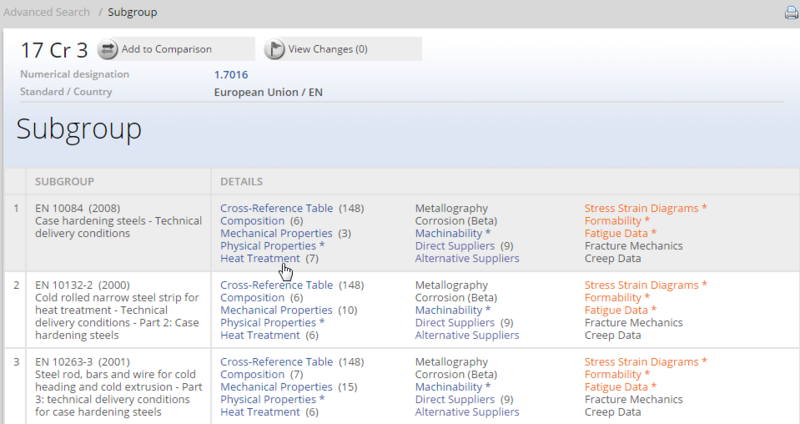 Among the shape memory alloys that have been developed, Au-Cd, Cu-Zn-Al, Cu-Al-Ni and the like have been noted as being comparable with the Ti-Ni type alloys. Particularly, the latter two Cu-type alloys are generally considered prominent in the view of their low cost. When comparing the two Cu-type alloys with each other, Cu-Al-Ni alloy is superior both in the shape memory performance and heat stability (heat resistivity). 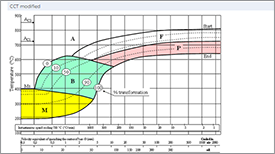 However, the defect in the Cu-Al-Ni alloy of low cold workability somewhat hinders its application. It has already been found that the workability of the Cu-Al-Ni alloy can be improved by blending Ti therewith to render the crystal grain finder. 3. Good mechanical properties (strong, corrosion resistant). There are still some difficulties with shape memory alloys that must be overcome before they can live up to their full potential. These alloys are still relatively expensive to manufacture and machine compared to other materials such as steel and aluminum. Most SMA’s have poor fatigue properties; this means that under same loading conditions (i.e. twisting, bending, compressing) a steel component may survive for more than one hundred times more cycles than an SMA element.